The computer supposed to go into sleep and stay at standby power state whenever users close the lid, or press the sleep button or power button which configured to sleep the PC on action, or issue the Sleep command from within Windows, or after idle from predefined duration of inactivity. Sleep allows device to enter low-power state that suspends most system components yet still able to resume working instantly. However, sometimes, you may notice that the device won’t stay asleep for too long. A few minutes after the PC goes to sleep or in the middle of the night, it wakes up itself automatically for unknown reason, without any user input or action. Stop any Wake-on-LAN magic packet. Disallow mouse and/or keyboard from waking up device. Identify and stop software applications that may wake computer up, such as TeamViwer and qBittorrent. Prevent connecting of USB devices from waking up the device. Disable Windows Update Power Management to automatically wake up the system to install scheduled updates. Another common cause for unexplained PC wakes up by itself automatically is network activities. Most devices connected to network will be receiving network packets from network activities that occurred in the connected environment, and this can wake PC. Open Device Manager (search or press Win +R to open Run dialog and run devmgmt.msc or select from Power Users Quick Access menu in Windows 8, Windows 8.1, Windows 10). 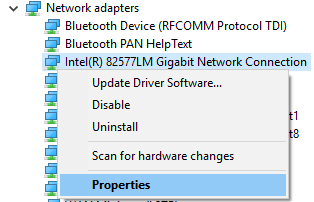 Right click on the network adapter that you’re using to connect to the network / Internet, and choose Properties. Uncheck the Allow this device to wake up the computer option to disable any network activity from waking up the device. 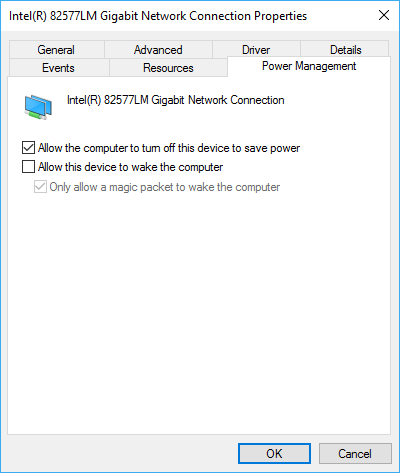 Check and enable the strong>Allow this device to wake up the computer option, but also tick to select the Only allow a magic packet to wake up the computer check box to only allow Wake-on-LAN magic packets to wake up the machine from sleep. Magic packet requires special program to send out command with unique signatures, thus making it unlikely to have unexplained wake ups. Another way to open the properties of network adapter is by opening Control Panel -> Network and Internet -> Network Connections, or Control Panel -> Network and Internet -> Network and Sharing Center -> Change adapter settings, where you will have a list of network adapters installed on the system. Once the setting is changed, the machine won’t wake when receiving network activity if that is the cause of the issue.